Christian Writer/Reader Connection: Series Books - Love 'Em, Hate 'Em? Yes, when the books are too far apart, the reader loses interest. As a reader, I forget what happened in the previous book if there's a big gap. I'll read anything. These look great. As far as writing goes, I'm drawn to write stand-alone. But we'll see. Always open to explore. I prefer stand-alones. Unless each book in the series is about a different character and can stand on its own, then I'm fine with that. So you think these are good? I just saw some in the library yesterday and almost picked one up but wasn't sure I'd like them. Hi Susan, well, what can I say? I am writing a series of 10 books on the Ten Commandments. They can be read seperately and in random order, so that's a pro, right? 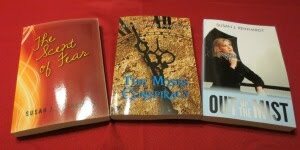 My books are small, a little more than 100 pages, so I can't really compare 'm with novels that are 250 or more. I wish you much success with your trilogy. Sometimes I like it to done...and other times, if I really loved the characters, I wish for a series to continue the story. Hi Jess - Both my mother and I loved them. They have the most interesting characters. Hi Marja - Thanks! You've got a massive project underway. Even a 100-page book requires an enormous investment of time and energy. Hi Loree - I'm with you. I like both. 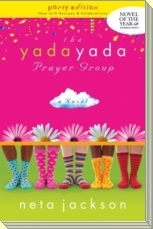 Hi Sarah - I loved the strong spiritual themes and how each character grew in their faith. That depends. I loved Jan Karon's Mitford series, and was sad when it ended. But I tired of the Left Behind series, which is way too full of horrible disasters for one family. I think it would be hard to write a series longer than three books, unless I fell in love with the characters and didn't want them to go away. I've written four books in Barbour's " Camp Club Girls" preteen series. It was fun, but also challenging coordinating my books with those of five other writers. I'd do it again in a heartbeat. Hi Jen - I also loved Jan Karon's Mitford series. I read most of the Left Behind series, but jumped to the last book. After a strong beginning, what should have been a fabulous ending seemed dull. Hi Karen - Series books that have a definite ending are a pleasure. I don't like a cliffhanger at the end of a book. Hi Sarah - Be forewarned - you'll be running to get the other books. :) I loved these, and was thrilled when some of the same characters showed up in her House of Hope series. Hi Jean - I can't imagine working with five other writers. A collaborative effort with one other writer (a pleasure) is about all I can handle right now.